It is becoming increasingly recognized that risk factors for vascular disease increase the risk for developing Alzheimer’s disease (AD), suggesting that the vasculature may be a contributing factor to the pathophysiology of AD. Furthermore, in the majority of AD cases, vascular deposits of β-amyloid (Aβ) peptides are observed in the condition known as cerebral amyloid angiopathy, suggesting that Aβ peptides may be biologically active at the vascular level. We present data demonstrating that low doses (in the nM range) of freshly solubilized Aβ peptides (1–40 and 1–42) greatly enhance the vasoconstriction induced by endothelin-1 (ET-1) in isolated, intact vessels. We also show that freshly solubilized Aβ peptides transduce vasoactivity via stimulation of a pro-inflammatory pathway involving activation of cytosolic phospholipase A2, cyclooxygenase-2, and 5-lipoxygenase. 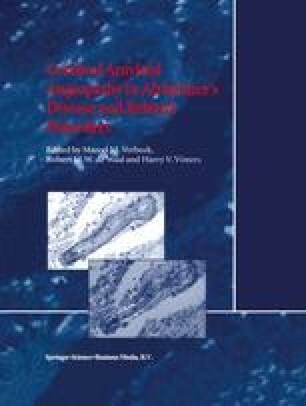 Our data demonstrate that soluble forms of Aß peptides (at doses similar to those found in AD patient plasma) are able to trigger a pro-inflammatory response in vessels, suggesting that, in AD, which has a significant inflammatory component, Aβ peptides may exert pro-inflammatory effects prior to deposition as insoluble Aβ aggregates.